Timberland Luggage is not just a brand, it’s a movement, and it represents giving back to the community and giving back to nature; owning a suitcase, or better yet a Timberland set, makes you part of this movement. Their design goals are lightweight products which not only help you beat the costs of travel, but which also ensure less weight goes onto a plane and therefore less gas gets used traveling any Timberland suitcase across the globe. Influenced by their New England Heritage, this brand has a unique culture surrounding it and their designs are founded on light packing for the outdoor on-the-move lifestyle. Timberlands 4-Piece Spinner Luggage Set stands as a testament to their innovative tests, technologies, and matching of modern trends; this set includes three fashion-forward suitcases at sizes 30”, 26”, and 22”, along with a modern backpack with added packing space you wouldn’t get with a regular personal item. True to their name and promise of outdoor lifestyle products, the suitcases designed for this Timberland set are a unique mix of rugged and fashionable. Featuring unique clasp pockets as well as zippered pockets, along with the materials used and their coloring, this automatically strikes a customer as the perfect set for a trip to the amazon, just because it has a certain jungle fashion appeal. Full grain leather trims also help create that amazon effect, and all three suitcases in this Timberland Luggage set match quite nicely without making any piece non-essential. Another interesting design feature is the number of pockets for extra storage, whereas many brands would have gone with zippered extensions and been lax about a suitcase’s exterior dynamics. Finally, the backpack is an excellent last addition which not only matches every facet of the set perfectly, but is very handy and easily the most outdoor inspired item for this collection. Large sets offer a wide range of storage options for long stays away from home; this set includes an overlarge checked bag at 30-inches for approximately 125 liters of packing space, although it also gives travelers the option of leaving the big bag at home for shorter trips where the 26-inch medium offers nearly 100 liters. For those shortest stints away from home that include business trips and weekend getaways, and also just for the security of having a bag with you for those times airlines lose your luggage, the checked bag at 22-inches is close to the limit for national and international flights but flies just under the radar with up to 50 liters of packing space. Other storage comes in form of multiple exterior pockets – one shallow face pocket for travel papers and small devices, and a deep zippered pocket with additional clasp protection and smart valet straps. Interior storage includes a massive central space along with a separated zipper ceiling pocket. 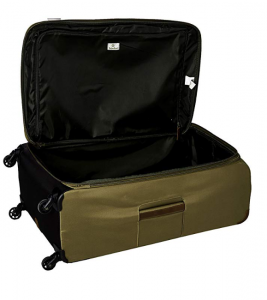 Timberland suitcases do not come with included toiletry kits, unlike sportsman brands like Swiss Gear which include clip-in for suitcases in their Swiss Gear Sion Collection. This collection features smooth easy-motion travel with a handy backpack and three suitcases which run on highly durable 360-degree multidirectional spinner wheels; additionally, the telescopic handles lock in place and are ergonomically designed. All zippers are highly durable and self-repairing and include the same stylish leather for pull tabs that the suitcase is also trimmed in. Side and top haul handles are incorporated into the suitcase for easy toting and removal from overhead compartments as well as luggage carousels. The backpack includes two small rectangular side pockets and a deep face pocket with a clasp rather than zipper. Access to the backpacks main compartment is by zipper and the central storage space is domed and can comfortably fit a protected laptop as well as 2-3 outfits in a pinch. 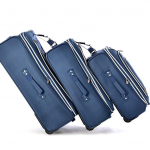 There’s little sense buying a large set of suitcases unless their lightweight and end up saving you additional expenses, especially when you’ll need to check 2-3 bags rather than the standard one. Each suitcase in this collection is crafted from ultralightweight polyester materials for final empty weights that are very unique to this set and the Timberland brand. The overlarge size, for instance, at 30-inches only weighs 11 pounds; which is impressive since there are so many checked bags at 28-inches which weigh up to 12 pounds unpacked. Likewise, the medium bag weighs in at 9 pounds, the carry-on at 7 pounds, and the backpack at a measly 2.5 pounds. Without the added space from zippered expansions these suitcases are somewhat limited on their packing space, but what they lack in extra room they make up for in all those fees you’ll find yourself avoiding. For all national and international travel, the 22-inch check on should weigh in at or around 45 pounds (though this can depend on the flight), whereas the other suitcases will need to be checked before security and be kept at or under 50 pounds. 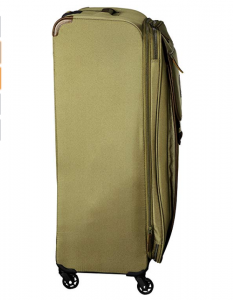 With an added watertight coating your bag will have no problems with the weather and will not age rapidly because of snow or rain, however these suitcases are somewhat limited by their weaker polyester materials – cotton canvas and nylon being the most durable materials for lightweight softside bags. Even the polyester denier rating – level of fiber thickness – is rather low at 600D and therefore more prone to bruising and small tears than other luggage. Timberland has somewhat compensated for this fact by weaving their bags with a ripstop design that adds about 400 threads to the original denier rating. 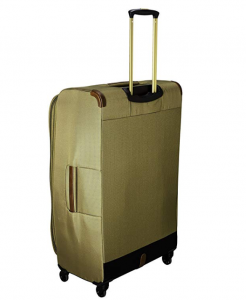 Other durability features include polypropylene spinner wheels capable of travel in most areas with no damage, a telescopic handle made from standard aluminum which lifts and pushes down smoothly, and elastic valet straps along with standard clasps and self-repairing zippers with durable leather pull tabs. Timberland luggage sets typically come with one standard color and design shapes for all suitcases without many other style options for making a suitcase fit your style. These bags come in a military color which is very flattering and quite stylish, it’s also business casual and ideal for all kinds of travel with all kinds of travelers.  Also listed with this product are more duffel-bag styled suitcases which Timberland offers, however these are certainly sportier and specifically crafted for deep woods travel and rougher areas of the world. In fact, Timberland is quite well known for producing rolling duffels with the highest quality, just like their 26” Wheeled Duffel on Skate Wheels. Another difference is that Timberland wheeled duffel sets include a messenger bag rather than a backpack, and it’s clear from customer opinion and general design factors that the backpack is favored for the heavy packing tool that it is. 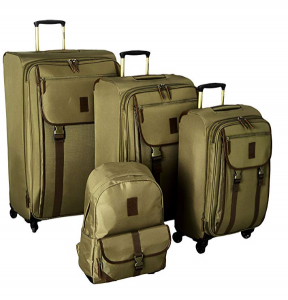 The sizes featured in this set include a military-style backpack measuring 16×13.75×9.5, a large checked bag which measures 30x16x12 inches, a medium checked bag at 26x14x10 inches, and a carry-on item rigorously tested to fit into all overhead compartments which sizes in at 22x13x9. Bags in this set are somewhat nestable, however the padded lids do cause somewhat of a tight squeeze when closing one suitcase over another for storage. 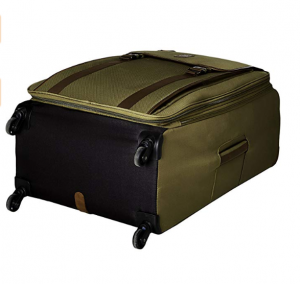 Another size feature is that each suitcase offers a deeper zippered face pocket than nearly all other competing brands, thereby giving customers the extra storage, they need, without compromising an excellent design with a bulky zippered expansion. Though Timberland does have expandable products; their Expandable Spinner Carry-On Suitcase can zip open up to 8 inches wide. Since 1973, Timberland luggage has been committed to offering the finest products which use only the best materials for strict quality control standards that keep customers satisfied and limit the number of suitcase duds on the market. Timberland products are warranted to be free of defects in regards to their materials and workmanship, and the warranty last for up to 12 months from date of purchase. What the warranty covers is general repairs and total replacements, however this does not include standard wear and tear or any damaging that are the result of misuse, neglect, accident, or modification. For requests of replacement or repair simply fill out a warranty form and mail it to their headquarters; also, be aware that warranties from unauthorized sellers will not be accepted, so always make sure the source you’re buying from is trusted. Timberland luggage knows how to design a one-of-a-kind fashionable set which beats all national and international weight limits while still fitting all the essentials that you need for your trip. Timberlands 4-Piece Spinner Set is rugged without being ugly and the ideal suitcase for the adventurer as well as the back woods junkie. The set includes a 30-inch large checked bag, 26-inch medium, and 22-inch carry-on as well as a unique backpack with a military look and tons of optional space. Although these bags use polyester and are rather on the low end of the durability spectrum, their cheaper than many nylon-using brands and make up for the low durability with a ripstop weave that keeps the polyester strong and the suitcase from ripping or being damaged while out on the road. Ripstop woven polyester buffs damage from minor to medium drops, bumps, and other accidents. Backpack is one of a kind and can fit your laptop and several additional outfits. Although the style is limited, it sticks to the Timberland brand with an outdoorsy look that’s also quite stylish. Nylon or cotton canvas bags are less likely to rip or otherwise be damaged. This brand has a fairly limited warranty which will not cover damage 2 or even 3 years down the line.